AWS OpsWorks Stacks uses Amazon CloudWatch (CloudWatch) to provide monitoring for stacks. For Linux stacks, AWS OpsWorks Stacks supports thirteen custom metrics to provide detailed monitoring for each instance in the stack and summarizes the data for your convenience on the Monitoring page. For Windows stacks, you can monitor standard Amazon EC2 metrics for your instances with the CloudWatch console. The Monitoring page does not display Windows metrics. On the navigation bar, select the stack's region. 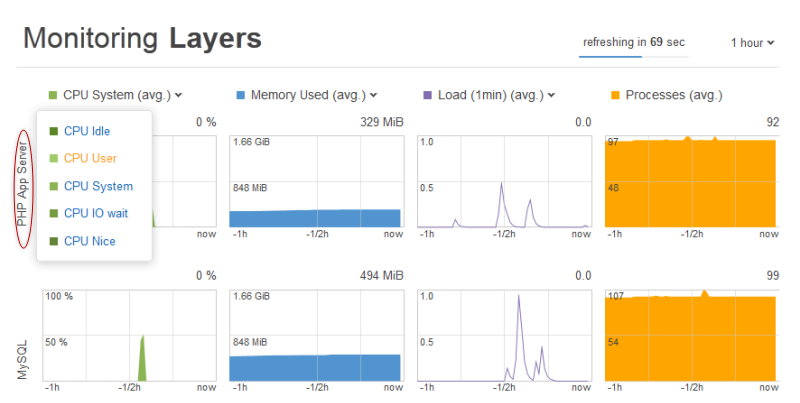 In OpsWorks Metrics, choose Instance Metrics, Layer Metrics, or Stack Metrics. AWS OpsWorks Stacks collects metrics by running a process on each instance (the instance agent). Because CloudWatch collects metrics differently, using the hypervisor, the values in the CloudWatch console might differ slightly from the corresponding values on the Monitoring page in the AWS OpsWorks Stacks console. You can also use CloudWatch console to set alarms. For more information about how to create alarms, see Creating Amazon CloudWatch Alarms. For a list of CloudWatch custom metrics, see AWS OpsWorks Metrics and Dimensions. For more information, see Amazon CloudWatch. 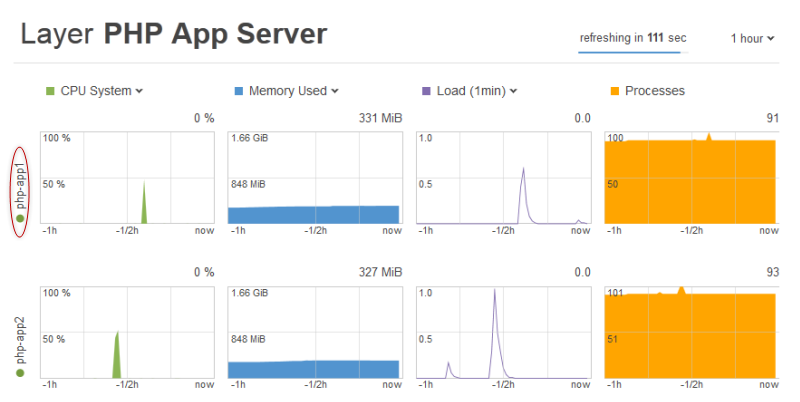 AWS OpsWorks Stacks sends the following metrics to CloudWatch every five minutes. The percentage of time that the CPU is idle. Valid Dimensions: The IDs of the individual resources for which you are viewing metrics: StackId, LayerId, or InstanceId. Valid Statistics: Average, Minimum, Maximum, Sum, or Data Samples. The percentage of time that the CPU is handling processes with a positive nice value, which have a lower scheduling priority. For more information about what this measures, see nice (Unix). As AWS allocates hypervisor CPU resources among increasing numbers of instances, virtualization load rises, and can affect how often the hypervisor can perform requested work on an instance. cpu_steal measures the percentage of time that an instance is waiting for the hypervisor to allocate physical CPU resources. The percentage of time that the CPU is handling system operations. The percentage of time that the CPU is handling user operations. The percentage of time that the CPU is waiting for input/output operations. The amount of buffered memory. The amount of cached memory. The amount of free memory. The amount of swap space. The total amount of memory. The amount of memory in use. The load averaged over a one-minute window. The load averaged over a five-minute window. The load averaged over a 15-minute window. The number of active processes. Average values for a stack. Average values for a layer. Average values for an instance. 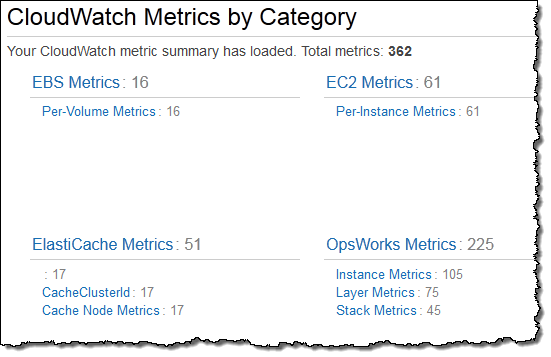 To view a summary of metrics for an entire stack, select a stack in the AWS OpsWorks Stacks Dashboard and then click Monitoring in the navigation pane. The following example is for a stack with a PHP and a DB layer. If a layer has more than one instance, the graphs display average values for the layer. You can specify the time period by clicking the list at the upper right and selecting your preferred value. For each metric type, you can use the list at the top of the graph to select the particular metric that you want to view. To view metrics for a particular layer, click the layer name in the Monitoring Layers view. The following example shows metrics for the PHP layer, which has two instances. The metric types are the same as for the stack metrics, and for each type, you can use the list at the top of the graph to select the particular metric that you want to view. You can also display layer metrics by going to the layer's details page and clicking Monitoring at the upper right. To view metrics for a particular instance, click the instance name in the layer monitoring view. 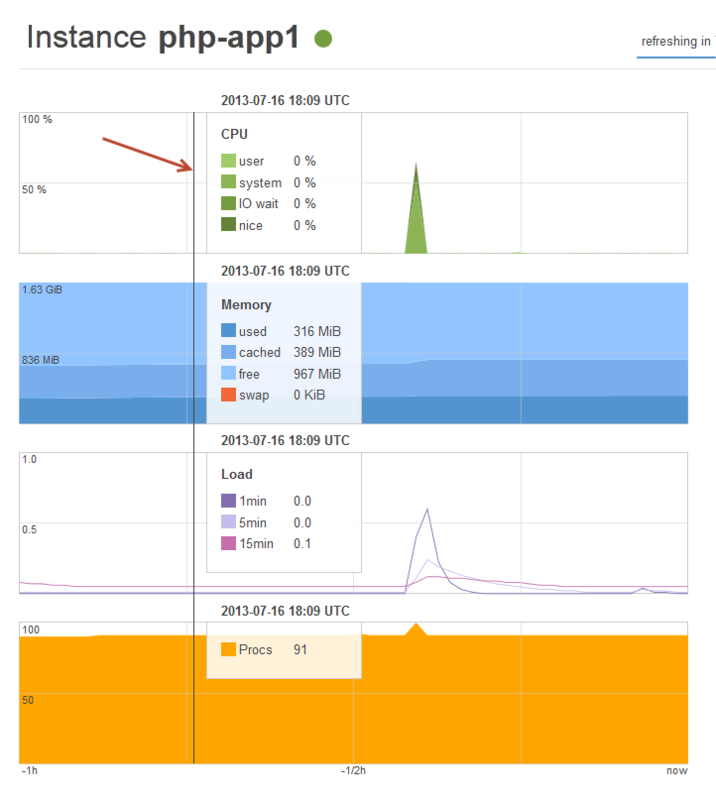 The following example shows metrics for the PHP layer's php-app1 instance. The graphs summarize all the available metrics for each metric type. To get exact values for a particular point in time, use your mouse to move the slider (indicated by the red arrow in the previous illustration) to the appropriate position. You can also display instance metrics by going to the instance's details page and choosing Monitoring at the upper right.